From March, the supermarket will increase its hourly payment to £8.20 from a previous minimum of £6.83 for shop workers. In London that could go up to an hourly rate of £8.95. Earlier this month, Lidl announced it was to pay a minimum of £8.20 an hour in England, Wales and Scotland. In London it will be £9.35 an hour and will take effect from October. Businesses are under pressure to increase the pay of their low paid workers. The National Living Wage as required by the UK government, which was set out in George Osborne's July Budget, is set to be £7.20 an hour from April 2016 for people aged over 25. Lidl raised its rates of pay beyond the minimum wage as recommended by the Living Wage Foundation. The Living Wage Foundation's current recommended minimal hourly rate is £7.85, and £9.15 inside London. The Foundation will announce a change in its recommended rates in November. Morrisons chief executive David Potts said: "We have been listening to our colleagues who told us they want their pay to be more competitive and simpler. "By paying a significantly higher hourly rate, we are recognising the contribution of our excellent staff, who are so important to the revival of Morrisons." As part of the deal, 15 minute rest breaks will no longer be paid. 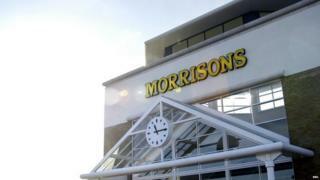 Staff told Morrisons they would prefer to have a higher rate of hourly pay instead. Britain's fourth largest supermarket chain will spend an extra £40m paying the new rate to more than 90,000 staff. The supermarket has decided to move its annual pay deal from October to March so it mirrors the new financial year. In recognition of the delay staff will be given a 2% lump sum of their wages before Christmas. Earlier in the month, Morrisons announced it was to close 11 stores with the potential loss of 900 jobs as part of plans to transform the company's fortunes. It also reported a 47% drop in half-year pre-tax profits to £126m. Joanne McGuinness, from the shopworker's union Usdaw, said the pay rise was being recommended to its members. "The new consolidated hourly rate is now the highest of the big four supermarkets, which is paid every hour not just when staff work at times that attract premium pay. It is a big step forward, and shows that the company is prepared to invest in the staff to help grow the business." Sainsbury has said previously its pay and benefits are comparable to Lidl rates of pay because it pays staff for time spent taking breaks. Asda and Aldi also pay for breaks. Market leader Tesco does not pay for breaks, but it has said previously that it pays one of the highest hourly rates in retail, of £7.39, and offers other benefits. Asda will pay a standard hourly rate of £7 an hour from 1 October, while at Aldi it is £8.15.